Strategists are starting to cast doubt on the powerful new-year rally in European equities. 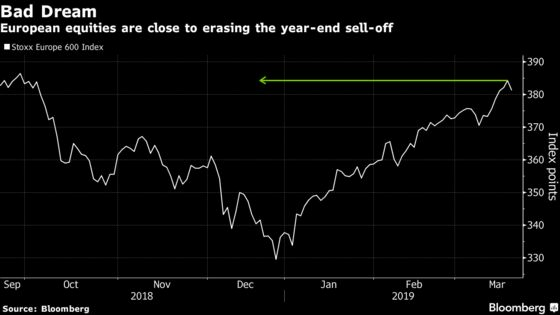 The Stoxx Europe 600 Index is expected to lose 6 percent from Wednesday’s closing levels to 358 points by the end of 2019, according to the average projection in the latest Bloomberg poll. The Euro Stoxx 50 Index, home of the euro-area’s biggest companies, is seen declining 4 percent from current levels to 3,238, according to the average survey estimate. The region’s equities this week almost erased the impact from the end of 2018’s sell-off as the dovish stance of global central banks and optimism that the U.S. and China will reach an amicable trade deal fueled a rebound of 13 percent. However, this year’s bounce displays signs of low conviction as outflows from European equity funds continue almost unabated and the monthly Bank of America Merrill Lynch fund manager survey showed that being short European stocks is the most popular trade globally. The European equity market remains a victim of messy politics, deterring many foreign investors, with all eyes focused on the U.K.’s Brexit deliberations, which show few signs of progress. U.K. and European equities are the most disliked regions globally, according to the BofA survey. Despite that, some investors such as Evermore Global Advisors are buying in and the likes of Morgan Stanley and BofA say European equities can outperform in the coming months. Those who believe European stocks can rise further emphasize their cheap valuations and say the potential bottoming in sentiment and economic data could spur foreign money manager interest. 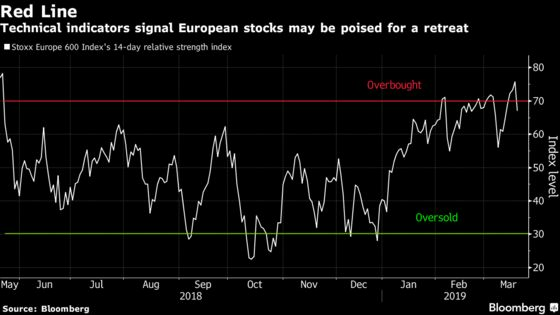 Another factor that could propel European stocks this year is profit growth outpacing that of U.S. companies, whose earnings boom is forecast to slow in 2019. Right now, earnings growth for companies in the Stoxx Europe 600 Index is projected at 5.8 percent this year, up from 4.7 percent in 2018 and compared with 5.1 percent for the S&P 500 Index. 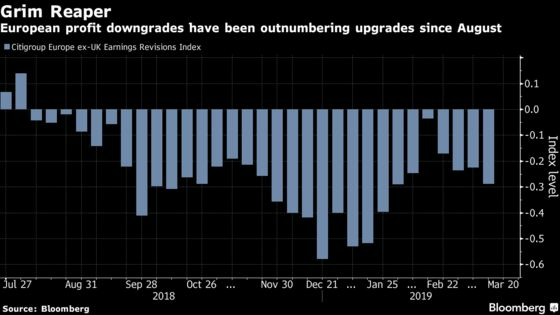 However, analyst downgrades of European profits have been outnumbering upgrades since August, according to Citigroup Inc.’s index. For a table on the Stoxx 600 and Euro Stoxx 50 surveys click here; here for the DAX; here for the FTSE 100.